Creating learning activities for preschoolers does not have to take much time or energy! Keeping things simple is where it’s at! As I begin prepping my preschool classroom for the beginning of the school year, I have been collecting supplies that can be used multiple times throughout the school year. When I came across the cutest mini clothespins recently, I immediately thought of apple stems! 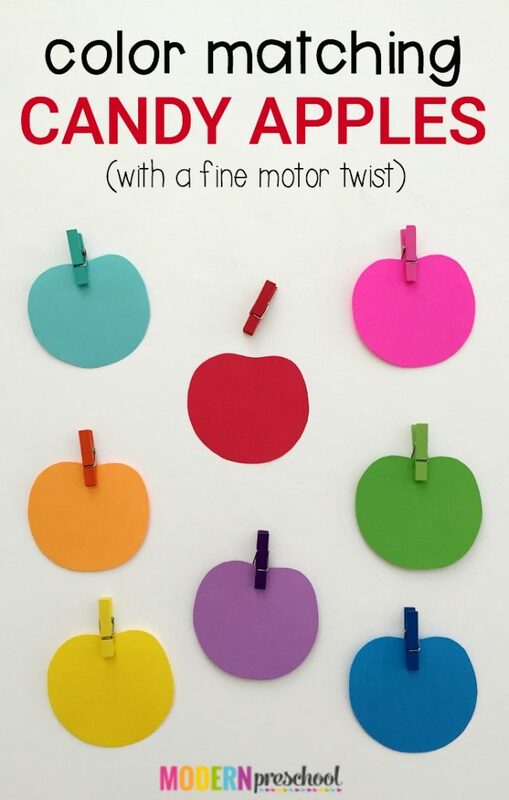 Creating this Candy Apple Color Matching activity couldn’t be easier! I couldn’t love how simple this activity is to set up. Seriously, I prepped 4 independent learning centers for my classroom in just minutes. 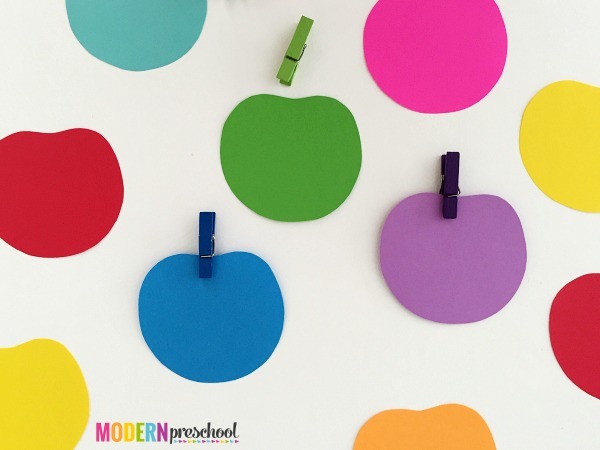 I plan to laminate the colorful apples before introducing this activity to my preschoolers. At the beginning of the school year, my 3 year-olds are a little more on the rough side with the stuff in our preschool classroom. I am that teacher who over exaggerates how NOT to use our learning centers during circle time, so they catch on quickly! To prep these Candy Apple Color Matching, I collected different colored papers. These included both cardstock and regular colored paper. If I was not laminating the set, I would have used all cardstock. I made an apple shaped pattern out of a scrap piece of cardstock (sometimes I use old file folders). Instead of tracing the apple pattern onto the papers over and over again, I folded the colored paper a few times and simply cut around the pattern while holding it in place. The paper colors I chose matched the colors of the mini sets of clothespins that I found in the back to school supplies. I’ll admit, I can’t walk through the aisles lately without grabbing at least one item for myself lately! 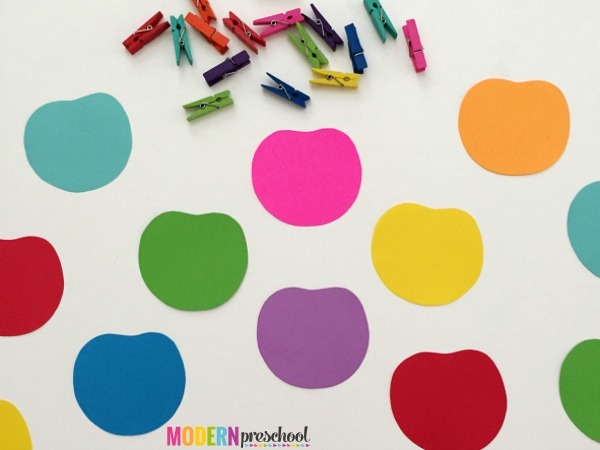 These mini clothespins made the perfect apple stems for this activity! The most basic way to play includes matching the clothespin to the apple of the same color. What if your child isn’t ready to match colors? No problem! Instead use this activity for fine motor strengthening at first. Then, show many examples of matching the colors. Maybe offer 3 different clothespins and one apple. See if your child can find the color that matches after placing all 3 choices next to the apple. 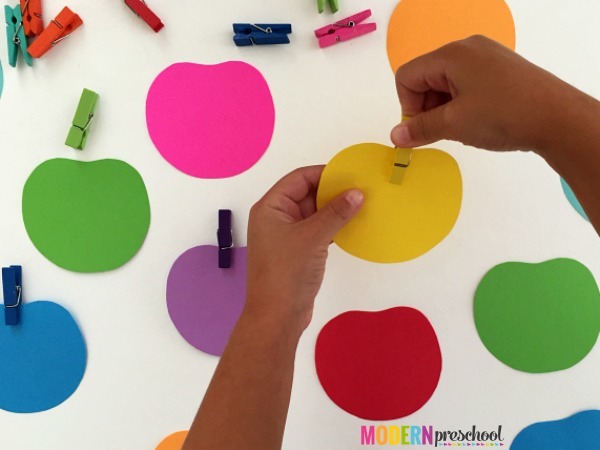 The great thing about this activity is that color recognition does not have to be mastered in order to match the clothespin stems to the correct apples! Are you all about apple activities right now? Or are you pinning ideas for later? Either way, here are a few of our preschool-tested favorites ideas!